This is one of my favorites - its a gaspeite - which is often used in Southwest jewelry. 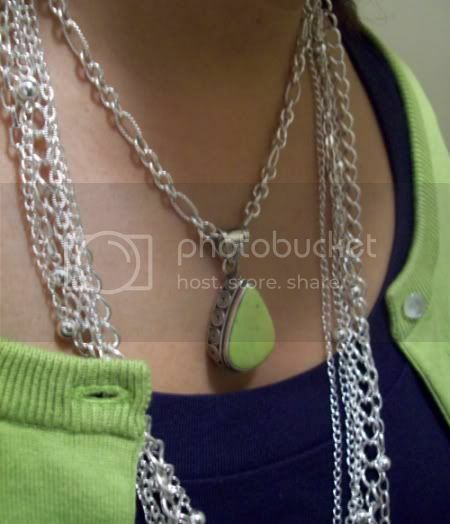 I highlighted it by framing it in a multi-strand silver chain. Color is a little bit off - in between the first and second picture. The reason I loved it (other then the color) is the silver designs on the side. I love little details like that! oh, i love the oolor of your cardigan. I'm not buying anymore grey, black or navy cardigans this season. For me, it's all about color. I love how the necklace and cardigan mke your outfit pop. Love the cardigan. I'm gonna have find one and 'borrow' this outfit. Patina - Yes! I keep looking at Grey ones too. I just love grey, and its not always so available - same with purple! Nika - Thank you!! if you really like this exact color - its called "Island Green" - Talbots had a bunch of stuff in the color - in their May collection, couple of things still online and in stores. I love that shade of green, and it looks really nice against the navy. And the addition of the necklaces makes for a stunning effect. That grean is so beautiful. I never would have though of pairing it with navy but it looks great. I'm totally loving ur idea of building an outfit based on your jewelery.Cant wait to see more! Carla / Jess / Nurimur and Kelly - Thank you! I love holding things up in my closet just to see what pops together. Miss - Oh yes! I saw that avocado color online - I have the same cardi in purple. Its a nice one - super warm! I love the colors of the cardigan and shirt together, particularly with silver jewelry! Funny that you mentioned "My So-Called Life" as one of your favorite shows. I never watched it while it was on the air, but started watching it over the summer since it's on Hulu. I love how complex all of the characters are, adults included, when it would have been too easy to stick with a flat stereotype instead. did i tell u that you have an amazing jewelry collection. 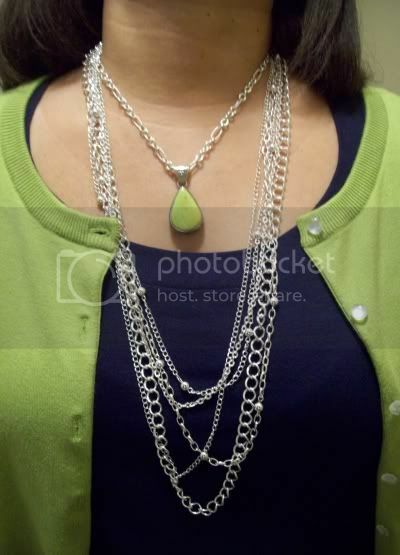 love the pink/peach ecklace that you are wearing in the next post.